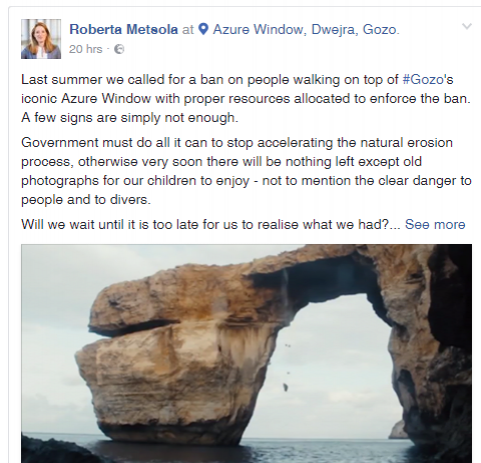 Large rocks came off as a man jumped off the iconic Azure Window in Gozo in this video uploaded to Youtube yesterday. The structure, a major tourist attraction, has been eroding rapidly and several large chunks fell off in recent years. The Gozo Tourism Association and the San Lawrenz council earlier this year said that allowing visitors to walk on top was of grave concern but they lacked the resources needed to monitor the area adequately. In 2013, a geological rock assessment by the Environment Ministry said the structure is not facing imminent collapse but further erosion is “inevitable”.